Students in 8th to 12th Grade and their parents are invited to attend the Second Annual Parent and Student Career Forum on March 7. The event is from 6:30 to 8 p.m. at Endress + Hauser Inc, 2350 Endress Place, Greenwood. Participants will hear from industry professionals, learn about success stories and discover the opportunities available after high school. Bill Pulliam, an architect who designed the Customer Care Center building at Endress+Hauser, will speak about all of the careers that are needed to build a building. Also there will be a parent speaking whose child pursued a trade/ certification after high school and a speaker talking about his path to the Carpenter's Union. 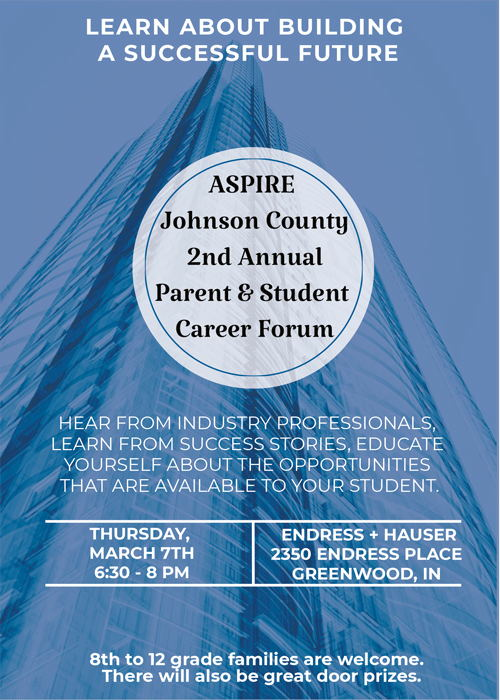 At least 15 industry professionals will be available to discuss their companies and answer career questions - including representatives from Next Level Jobs, Republic Airlines, Adult Ed, Fed Ex, Vincennes Logistics and Franciscan Health.